The word diamond comes from the Greek work unbreakable or unalterable. Whenever we hear that word we also hear all the clichés. Diamonds are a girl’s best friend. Diamonds are forever. Diamond in the rough. No pressure, no diamond. Blood diamonds. Conflict diamonds. I made the mistake of looking for diamond sayings on the internet and found thousands; way to many to recite on this very short article. In my technology article I touched on a lot of the ways diamonds are used in those ways because of its chemical composition and conductive properties. There are industries that use diamonds because of their hardness properties being the hardest natural occurring substance found on this planet. I did take my research a bit farther and found that not only had diamonds lost their hardness title to a few man-made compositions but a few years ago two natural occurring compositions were discovered to be up to 50% harder than diamonds. The only problem is they are both so rare neither one would ever become a mainstream product like diamonds have become. What’s funny is that the hardest (diamonds) and the softest (graphite) natural occurring substance is made of the exact same thing (carbon). If you want to go a little further with carbon, the human body is made up of mostly three things oxygen, hydrogen and carbon 93% add nitrogen and we have four elements that make up 96%of the human body. I remember one of the Star Trek movie aliens referring to humans as “carbon units”. How do we get different substances from the same element? These are called allotropes and basically that refers to the different ways the element bonds and in what configurations. For instance, graphite conducts electricity very well whereas diamonds don’t. You can use coal to heat your home but not diamonds (although why would you). I didn’t really want this to turn into a chemistry lesson but its looking that way. Carbon is one of the most plentiful elements on earth. Every living thing, plants and animals are made up of it. We breathe it out in the form of carbon dioxide and plants breathe it in. It is all around us in the form of gas and oil and plastics and believe it or not a lot of clothing. Let’s go back to diamonds. Natural occurring diamonds are made between 140-190 kilometers below the surface of the earth taking carbon and applying a huge amount of time, temperature and pressure to it. They are then brought to the surface by way of volcanic eruptions. Diamonds were first recognized and mined in India about 6,000 years ago where they were treasured as gemstones. It wasn’t until later that their industrial uses became known. Fast forward to the 1700s and diamonds are being discovered in other places around the world. Now the biggest producers of diamonds are South America, Africa, Australia, Russia and Canada. They are classified by what the industry calls the 4 C’s of diamonds and they are cut, colour, clarity and carat. So, this is our February issue and February has valentine’s day. I always thought that Valentines day would be the most popular proposal day as its probably the easiest for a lot of guys. I was wrong but not too wrong as the most popular days for engagement is Christmas Eve, Christmas day and New Years Day rounding out the top three. Looking at a half dozen surveys Valentines day is still in the top 10 of proposal days. Having said that lets help these young men (average age of engaged couples is 24 right now) pick out the ring to pop the question. When you talk about engagement rings you look at two things, the metal ring and the rock. I am by no means an expert so if there are those of you reading that know more about rings than me please be kind. 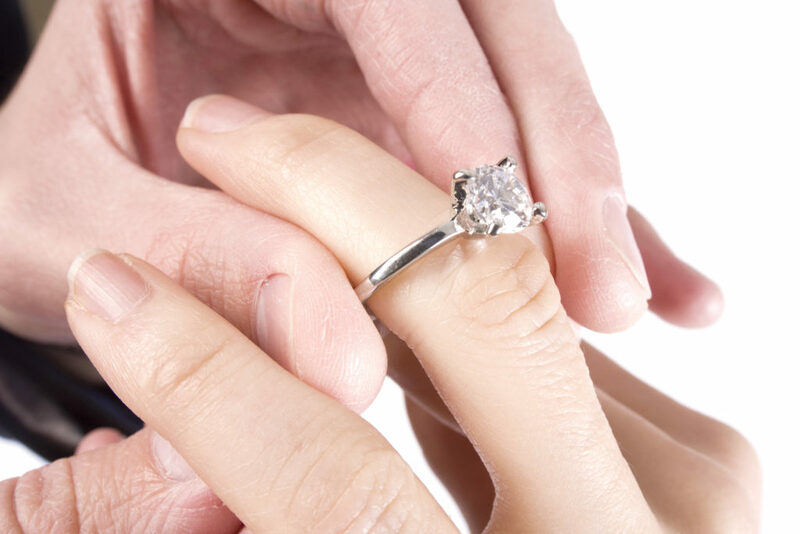 As buying a ring is not a do it yourself type project you will more than likely end up going into a jewelry store to pick one out and I suggest you lean a little on their advice. Having said that lets break it down into steps. First you will need to establish your budget. Back in the 30’s the biggest diamond company in the world at that time was De Beers corporation from Johannesburg South Africa. They did everything from diamond exploration to mining to retail, controlling the entire supply chain. This is the company that had the slogan “A Diamond is Forever”. They also created in the 1980s a huge marketing campaign that basically stated that your fiancé should be worth the investment of two months salary or more implying if you spent that much that other men seeing the huge ring on her finger wouldn’t hit on her. It really was brilliant marketing as many years later men still talk about two months salary but don’t know why. Back to your budget we can throw out the two months thing and really decide on what you can afford. Next it really should be a surprise. Figure out a time place and scenario. It doesn’t have to be elaborate, but you should put some thought into it. Now we look at the ring. What is her style and her size. Try and grab a ring that she doesn’t wear very much and run it down to the jeweler to get the size. If you end up now getting the size right its not that big of a deal to get it resized later. Next you pick out the style of band for the ring. Is it thin, thick, fancy, plain, gold, silver or some other metal. Lastly, we look at the diamond and not only do we pay attention to the 4 Cs but also the shape. I always thought shape and cut meant the same thing but I was mistaken. Cut refers to the angles that the stone has been cut to and while the other three Cs are determined by nature a diamond cutter determines the cut. Diamonds that are well cut tend to sparkle more. There are many colours that diamonds come in some being worth more that others. This will definitely be a personal preference. Clarity refers to whether there are other minerals or imperfections in the diamond. Finally, we get to carat which is the weight of the diamond. The bigger the diamond the more you will be paying and for those of you that are fact junkies (just in case you go on Jeopardy) one metric carat is .2 grams and the largest rough diamond weighs in at 3,106 carats. Now that I have given you way more information about diamond that you’ll probably ever need, if you do get engaged this Valentines Day don’t forget to grab out 2018 Bridal Guide right next to where you picked up the Stew and from all of us, congratulations.